Even rock and roll girls like myself can admit that there is nothing cooler than seeing a great hip hop show at the legendary Shelter. There is something so very special about that room and that stage. Dancing and having a great time at a show during the hottest days of the year will always be one of my favorite ways to celebrate the summer. 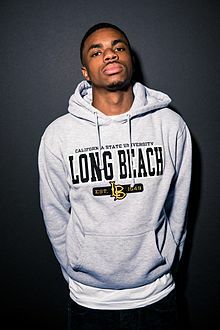 This Friday, July 17th hip hop artist and California boy Vince Staples will be coming to town alongside Achromatik. Vince's latest release Summertime '06 was released this past June to rave reviews. In fact, he was chosen as part of the XXL Magazine 2015 Freshman Class. Vince seems to have a very promising career ahead of him, so this is your chance to catch him perform before he makes it "big". Tickets for the show are only $15 in advance, they can be purchased here. We also have two pairs of tickets to give away to two lucky readers courtesy of Live Nation Detroit. If you would like to enter to win a pair, please email your full name to hipindetroit@gmail.com with the subject line #Vince. We will draw two winners the day before the show and we email them details on how to claim their prize. Doors for the show are at 7 p.m. this Friday and The Shelter is located at 431 E. Congress in Detroit.